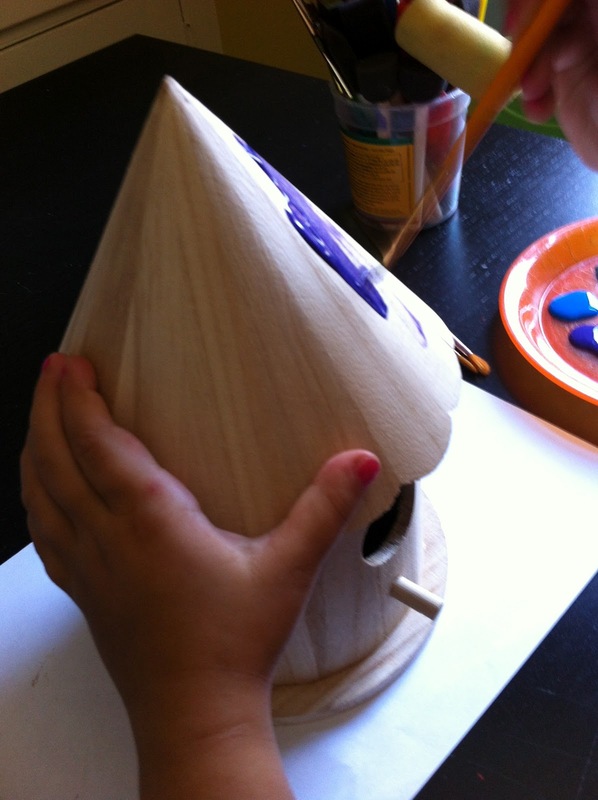 One of the Bee's items on our Summer Bucket List was to make a bird house and honestly we didn't get to it. A few weeks ago while at the craft store picking up some supplies for another project we walked past a row of small wooden bird houses on end of summer clearance. I pointed them out to the Bee, asking if she might want to get one for our bird house. She looked at me very confused for a moment before responding "Those aren't bird houses Mommy, they are fairy houses." And this right here is why I love hanging out with kids, they see things much differently then adults too. Their world isn't confined by labels, background knowledge and personal experience. Instead things are so much more filled with possibility. So needless to say we then had to get the fairy house. Maybe we will save the birdhouse for next summer. When we got the house home the Bee selected some acrylic paints she wanted to use and began painting her house. After the paint dried a little she felt the fairy house needed a little shimmer, and really what fairy house doesn't need a little shimmer. So she added some glitter glue. We let the whole thing dry a few days, then I gave it a few coats of varnish to protect it from the weather. The Bee then found the perfect place in our yard for the fairy house. She has been going out back every afternoon to check on the house and see if the fairies are liking it. She has some more big plans, like a button side walk and some notes for the fairy that we are working on now. WOW! She is so cute while painting. Good job little girl. Building a Fairy Garden House is such an awesome thing to do. Nice blog, keep it running!